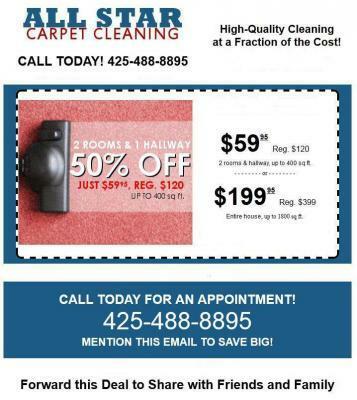 Professional Carpet Cleaning Services for Home and Office in Mill Creek,Wa. Our professional carpet cleaning services are meant for both residential and commercial purposes and we use the most efficient method for cleaning carpets of all: steam cleaning. In order to be able to provide these services, our company uses truck mounted steam cleaning machines. These machines have a heat exchanger for heating the water and use the method called steam cleaning, which is similar to hot water extraction, for making your carpets look and feel like new.Dirt, dust, stains, grease, sand and microbes are the agents that can make carpets look and smell bad. While these particles can be removed through different methods, classical or modern, there is no method more efficient than the ones that use steam. The high temperature of the steam is the primary agent responsible for removing the unwanted particles from the material. The steam can decompose the particles and then the particles are absorbed through vacuuming.A mixing of steam and different chemicals is sprayed onto the carpet. A heat exchanger heats the water until it reaches very high temperatures and it is transformed into vapors that can sterilize and clean the carpet. Compared to the similar method called hot water extraction, the amount of water that is used is very small. The machines meant for this purpose are designed in such a way to offer optimum results for carpets used indoors.Professional carpet cleaning services in Mill Creek,Wa. constitute a good way to save time, because our employees can do the dirty work for you and you will be able to focus on the things that are of the most importance for you, such as spending time with your family or improving your business. If you want your carpets to be really clean, then steam cleaning is the best solution to use. No matter if you want to clean the carpets from your home, or you have a company and need cleaning for your office carpets, our employees will do their best to help you breathe a healthy air in your rooms and you will get rid of awful smell caused by dirty carpets or rugs.